What happens to the bows after they come off of gifts . . . well, you can decorate your head with them. I’m not sure if Julia put it on her head first or if Emily decorated Julia with it. Julia definitely took the bow off, looked at it, and then put it back on her head. 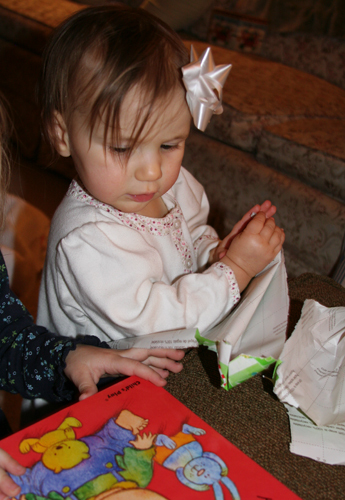 Last Christmas, we had a little baby laying on the floor covered with all the bows that came off the gifts. I guess this year we will have a toddler covered with bows. Fun times! !